At noon I ran along the chip trail that followed the quiet current of a canal, dodging green goose turds drying in unseasonably warm February sun. A small breeze from the north suddenly backhanded the right side of my face with the musky tang of fox pee. I confess to a small private conceit. I know the smell of fox piss. Mostly I keep this to myself. These aren’t bragging rights that you haul out to claim your fame at the local pub. I can see them all nodding in admiration. “Oh wise olfactory one.” Sure they would. There must be twenty reasons why I know the smell of fox urine. Ten of these came in a string of early summer evenings a long time ago, when my buddy Ken and I carried fly rods to the river to meet fat rainbows that slashed and slurped an evening meal of stoneflies rising in yellow clouds over darkening water. We trespassed along a quarry road, then followed an old river channel that in summer was only an intermittent trickle. Every evening the red fox was just ahead. His slender dog prints dimpled the sandbars. His pee stations smelled mildly of skunk. Ken says skunks and foxes smell like French Roast coffee. I like French Roast coffee. So does Ken. This fox was especially fond of a large river-rounded cobble poised just where the old watercourse made a hard left turn toward the main channel. The stone often glistened with his urine. Finally, one evening I made that left turn near his peeing rock and looked ahead. There he was, a lithe and rusty red flame trotting along a sandbar. He glanced back, dodged hard to the right, and disappeared into willow brush. The following day in this ridiculously warm February, I ran the opposite direction along the foxy smelling trail next to the canal. They were just across the channel--a pair of red foxes sunning on the south-facing bank of a small peninsula covered with blackberry brambles. I stopped. Of course I did. The foxes weren’t particularly elegant at the muddy end of a Willamette Valley winter. Their fur was a little grubby, white tail tips dulled by dirt. Probably they were mates and had been excavating a den. One of them rose and vanished into the brambles. The other was content to curl in the midday warmth, peering through its bushy, wrap-around tail. Two women walked by. I pointed out the fox. One of them was excited, the other concerned. 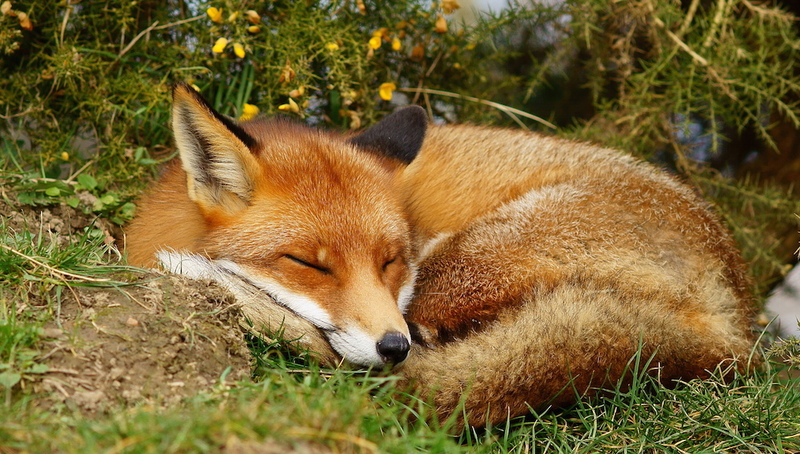 She felt that a wild animal, especially one as elusive as a red fox, wouldn’t be openly napping at midday unless it was sick. Anxiety kept her from accepting this gift of beauty, an animal of evening snoozing in noon sun. Me? Well. There must be twenty reasons why I love the smell of French Roast.